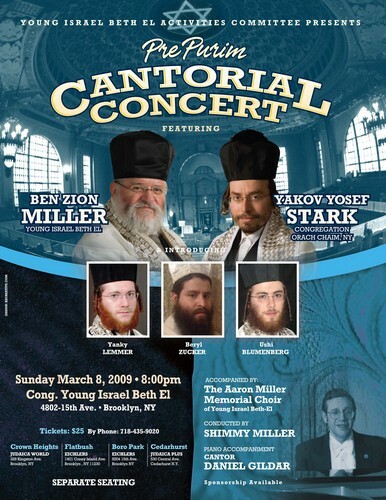 Young Israel Beth El Activities Commitee presents a Pre Purim Cantorial Concert featuring Bentzion Miller and Yakov Yosef Stark. Introducing Yanky Lemer, Beryl Zucker and Ushi Blumenberg. Accompanied by the Aaron Miller Memorial Choir conducted by Shimmy Miller. Piano accompaniment by Cantor Daniel Gildar. Sunday March 8, 2009 at 8:00pm. Cong. Young Israel Beth El – 4802 15th Ave. Tickets $25 by phone- 718-435-9020. Separate Seating.